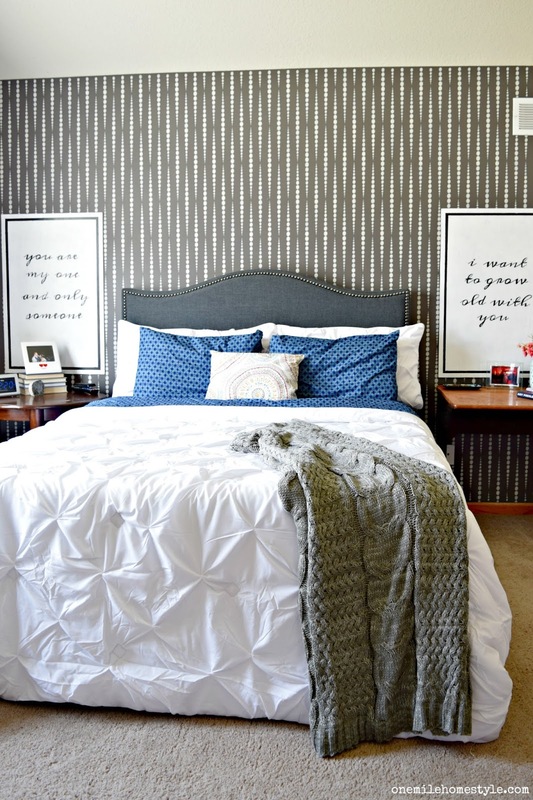 So, if you haven't seen the Bold Neutral Master Bedroom reveal, you definitely need to check it out! Go ahead, I'll wait. Welcome back! Part of the room makeover was coming up with some art for over the nightstands. It needed to be something fun, but it couldn't be too busy and compete with the stenciled wall behind it. In the interest of keeping things fun, I decided on a couple of movie quotes that we often say to each other, and chose to turn them into bold black and white typography art. This was a simple DIY project that anyone can complete! The first step in this project was painting the two sheets of wood with a couple of coats of white paint. 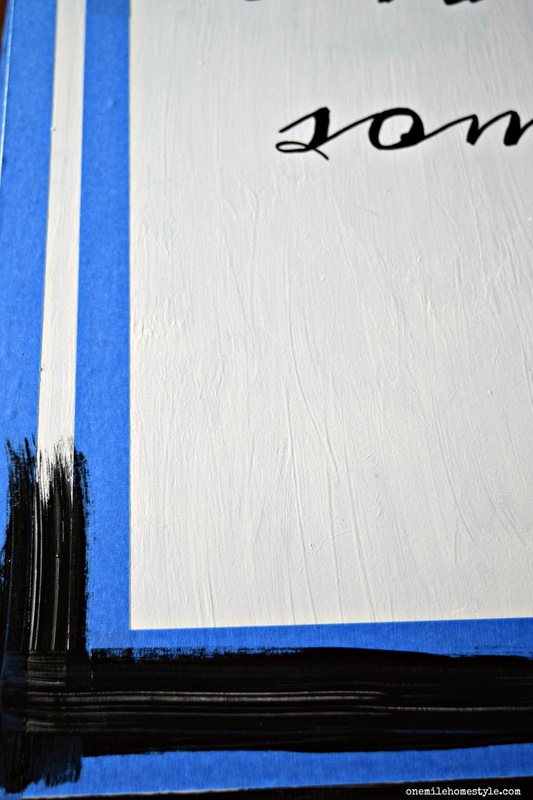 (If you are using a canvas, you can totally skip this step.) While that was drying, I printed up the quotes I wanted to use, and cut out the words so I could figure out my spacing. 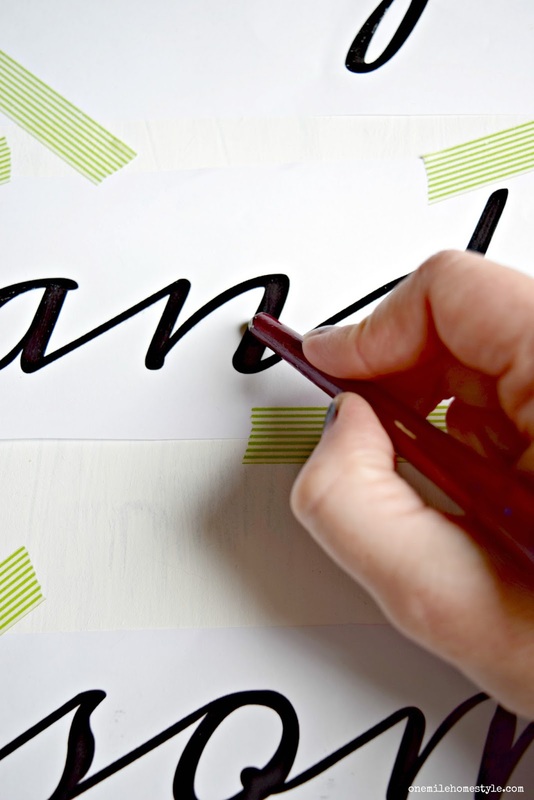 There are so many ways to transfer lettering, and I prefer the chalk method. You simply rub chalk on the backside of the paper (I used blue chalk so I could see it better), tape your paper into place, and then using the end of a paintbrush, trace over each letter. You may want to go over the letters a time or two, just to make sure you got a good transfer. Then carefully peel your paper up to reveal your template. Originally, I thought I would paint the letters with a brush, but I am so glad I decided to use a paint pen instead. It was so much faster, and I felt like I had much more control over the lettering. That's not to say every letter is perfect, but when it's up on the wall, those little imperfections fade away. The final step was adding the "frame" around the quote. I measured 1.5" from the edge of the wood and taped that outside edge, and then measured another 1/2" from that, and taped off the inside edge. I gave the frame section two coats of black paint, removed the painters tape, and let it dry. 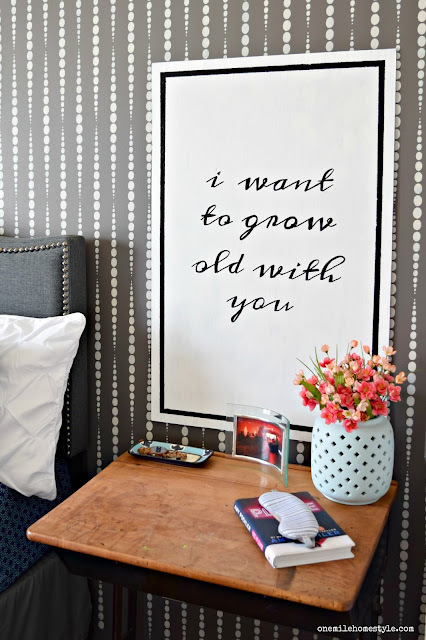 This new DIY wall art is exactly what I was looking for in this space, and I am so happy with how it turned out!Typography art is an easy way to add a personal touch to any space in your home, and it's such an easy DIY. Now, who can tell me what two movies these quotes are from? I really enjoy having and making DIY wall art. This is a gorgeous example, the plain black and white is striking and somehow calming. Love it. I really love these signs and the sayings you chose. So perfect for a bedroom.